Planted tanks and discuss go together like peanut butter and jelly. There's almost no more colorful, majestic freshwater fish than the discus, and seeing a school of them swim through some of Takashi Amano's aquascapes is breathtaking. I've even considered keeping some...that was until I saw the rigorous water changing schedule required to keep them healthy. My plants (and algae) keep me busy enough. A fussy $50+ fish that requires a daily water change? Maybe when I'm retired. If you have the time and dedication to care for these gorgeous fish and live near the Dallas area, you may be interested in the 2010 North American Discus Association (NADA) Show that will be held on June 10-13 of this year. For $45, you get a discus show, an auction, and a slew of speakers discussing everything from Discus 101 to Diseases and Sickness. Heck, for $45, forgo the hundreds you'd spend on the fish and live vicariously though others for a few days! Spent the afternoon playing around with Picasa's built in movie maker and I put together this video of the top 27 aquascapes from this year's International Aquatic Plants Layout Contest. 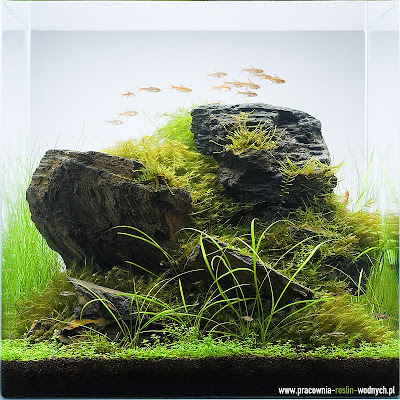 The aquascape in position 20 is missing, but all the rest are there, in high resolution glory! I hope the soundtrack and pacing is a little better than the other IAPLC 2009 video I found. You can watch a HD version, in a bigger format on YouTube. Enjoy! First, the pros, and there are lots of them. You'll find that most come with some caveats though. 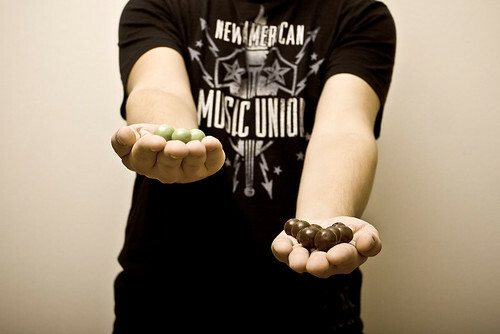 The first one that jumps into many people's minds is their lower energy consumption. Most high powered LEDs (the sort you use for growing plants) only use 2-4 watts of electricity and pump out anywhere from 100 to 300 lumens (for comparison a 70 Watt metal halide bulb produces around 5000-6000 lumens). So depending on the size of the aquarium and the quality of LEDs that you buy, you could see a slight drop in power consumption. However, this drop is not huge, contrary to popular belief. If power saving is your main qualification, I'd lean more towards T5 fluorescents (these usually put out about 2000 lumens for a 24 watt bulb). Another benefit of using LEDs is that they don't emit quite as much heat as high temperature metal halide lamps do. Again, there have been misconceptions about LEDs thinking that they don't create much heat at all. Regular low powered LED's don't really, but high output LEDs do. Substantial heat. So much that you need heat sinks and fans to keep them cool. Granted, they don't get quite as hot as metal halide lamps, but they require more robust cooling systems than any fluorescent fixtures. And heat is critical determinant to how long an LED lasts, which brings me to my next point. LEDs last a long, long time if they are treated right. This is a huge benefit over fluorescent bulbs that dim or shift their spectrum and need to be replaced every 8-12 months. I just shelled out $70 for two new bulbs for my 2 x 96 Watt CF fixture and will need to do so every year. LEDs should last the life of your aquarium (or at least 50,000-100,00 hours) provided their temperatures are controlled. You see, the lifespan of an LED is directly linked to its operating temperature. The hotter they run, the sooner they burn out. This is why heat sinks and cooling fans are necessary. Another big difference between bulb type lighting (fluorescent and metal halide) and LEDs is that LEDs do not require fancy reflectors. They emit all of their light in one direction via highly efficient internal reflectors, and therefore eliminate inefficiency due to light bouncing off the reflector and back into the bulb or off into the room instead of into the tank. If you are putting together your own DIY fixture, this means that buying a reflector isn't always necessary (depending on your LEDs) and can save on costs and space a bit. LEDs are small, and produce a lot of light in a very small space. Only metal halides pack as much light in a small space. Try lighting a nano tank to levels that qualify as high light with a flourescent and you'll see why this is awesome. In order to be high output, fluorescent bulbs need length...and that won't work on a tiny tank (except spiral CF bulbs). You can't really put a 70W metal halide over a nano tank either, unless you're planning on boiling some water. This small space footprint also brings up another benefit of LEDs, although it is purely aesthetic. LEDs produce that ever-illusive shimmer effect. You know, the glimmer in the water that sun casts that just looks so awesome. Until LEDs, only metal halides could do that, since they were the only other point-source (meaning all light is emitted from a small area) fixtures available to planted aquarium keepers. As stated before, metal halides don't really work over smaller tanks for obvious reasons. Now those of you with smaller tanks can bask in the shimmering glory as well! Finally, LEDs can produce exactly the wavelength of light needed by plants. There are very specific wavelenghts that plants use for photosynthesis, and if you didn't care much about how the planted tank looked to the human eye, you could buy LEDs that only emitted these wavelenghts. Of course, that wouldn't look very pretty...or natural, since it would be only red and blue light. But the point is you can control the wavelengths present in your lighting, instead of a wide range produced by other types of lights. There are a few cons to LED fixtures, the largest being cost. LEDs are just too expensive still to use for large aquariums and provide the light necessary for plant growth. At approximately $10 an LED, not including controllers and cooling systems, the costs quickly add up. It's easy to see how commercially produced fixtures like this one sell for $700-$1000. Eventually, the costs will come down as high output LEDs are put into more and more applications, but for now, we're stuck with paying for this new technology. Another downside of LEDs is that they still produce a large amount of heat. They aren't the ideal solution for aquariums that are highly sensitive to heat, or in hot climates where keeping the tank cool can mean running a chiller or blasting the air conditioning. They don't quite reach the temperatures of metal halides though. And finally, considering there are only a few large commercially produced LED fixtures available, if you want to light a smaller tank, or if you can't afford the large fixtures, you'll probably have to make your own using parts bought online. This requires soldering, wiring, and constructing a housing that can effectively cool the LEDs. It's no small undertaking, but it is possible and fairly straightforward. Final verdict: If you have a small tank (too small for most fluorescent tubes and metal halides), some electrical DIY experience, and don't mind putting together a cooling system, a small LED fixture is probably your best option for high output lighting. Another amazing ADA gallery visit video has surfaced, and let me tell you, it's another 4 minutes of awesomeness. Like the last video, it's shots of all the aquariums set up in the ADA gallery in Niigata, Japan, but this one is a bit higher quality. You get to see plenty of aquascaped planted aquariums, a few glimpses of a salt water aquarium, and some really neat nano aquariums. I especially love the emergent ferns in the tank at 3:25 (not to mention the spotless sand foreground and gorgeous Roseline Sharks). All I can say is it must take a lot of work to keep each one of these aquariums that clean and immaculate! Be sure to check out the thread for some still photos of the visit as well. There's a lot to like about iwagumi aquascapes. Their simplicity is calming and beautiful and there's something special about watching a school of fish hover over a "field" of grass. 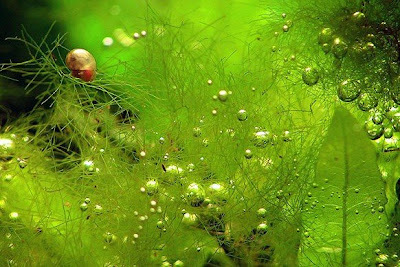 Starting your own iwagumi aquascape, especially your first, is likely to lead to the exact opposite feelings: lots of pulling out of one's own hair and frustration as your aquascape is consumed by every algae known to man. Why? 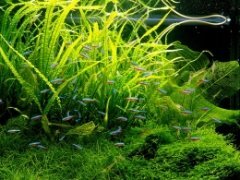 Well iwagumi aquascapes usually rely on only 1 or 2 species of plants, usually carpeting plants like dwarf hairgrass or HC, which don't grow particularly fast or soak up a lot of nutrients. Let's imagine a typical beginner mistake starting up an iwagumi aquascape. 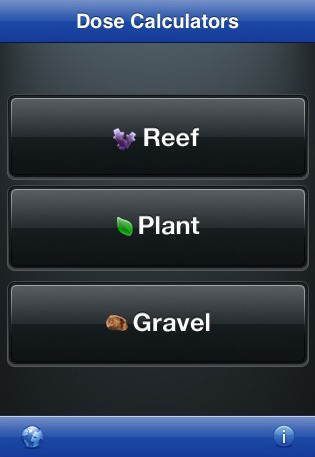 When you first start an iwagumi, chances are you have some rocks, and a species or two of carpeting plants. You probably have a CO2 system of some sort, and pretty powerful lights and a fertilizing schedule. The aquarium probably looks pretty barren, aside from a few sprigs of plants strategically placed. Fast forward 3 weeks and you probably have a mess of algae that has covered your rocks, plants, and even substrate, suffocating the remaining carpeting plants into submission. What happened? 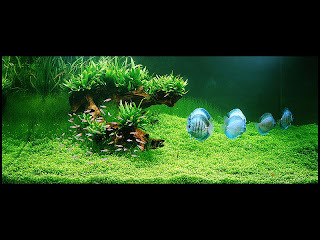 You created a perfect environment for algea. When you set up a tank, it's critical for your aquatic plants to establish a dominance, soaking up all the nutrients they can. If you don't have enough plants, algae moves in and will smother everything, thriving on the excess nutrients your plants aren't using. So how can you avoid this when you set up your first iwagumi aquascape? The key is fast growing stem or floating plants. Add as much of these as you can, without shading out the carpeting plants. They are excellent at soaking up excess nutrients and some even release chemicals that retard the growth of algae (called allelochemicals). 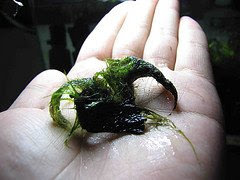 They don't have to disrupt your pefectly planned iwagumi layout, simply float them in your aquarium for the first few weeks, or until the carpeting plants have a chance to take hold and spread. 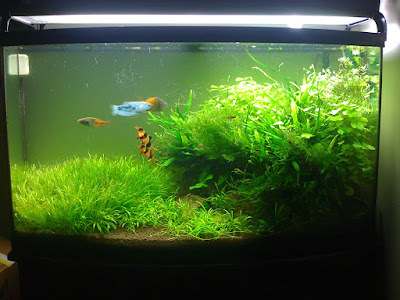 Also, hold back a bit on fertilizing until your plants really start growing, and fertilize in proportion to the amount of plants you have in the aquarium. Gradually up the fertilizing, keeping track of algae and reducing it if you see the algae starting to crop up. This helps swing the balance in favor of your aquatic plants, and algae won't have as much of a chance to gain a foothold. 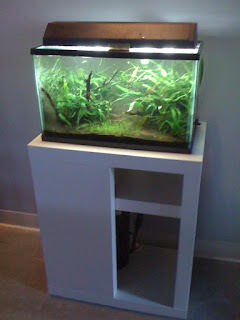 Some plants that work particularly well at keeping algae at bay in the early weeks of a newly set up aquarium are Hornwort, any hygrophila species, or any floating plant (although these can quickly become a pain to get rid of since they grow so quickly and tend to hide in everything--I'm looking at you duckweed!). 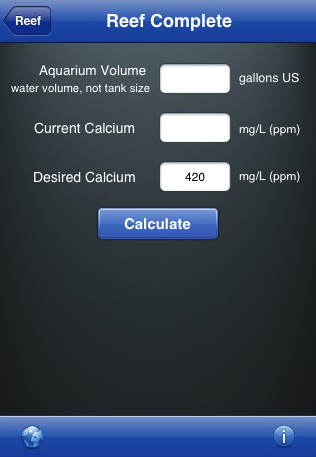 If algae does get out of balance, the best thing to do is reduce your lighting period, reduce fertilizer dosing if you are dosing too much, make sure your CO2 is steady and wait. As long as everything is balanced, your plants should be able to outcompete the algae and your iwagumi will be back on track. 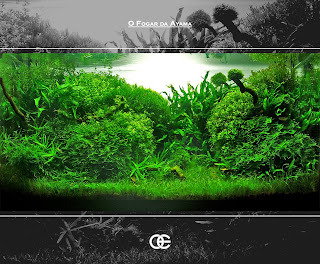 This aquascaped aquarium is a simple, but stunning work from Jorge Oliveira. 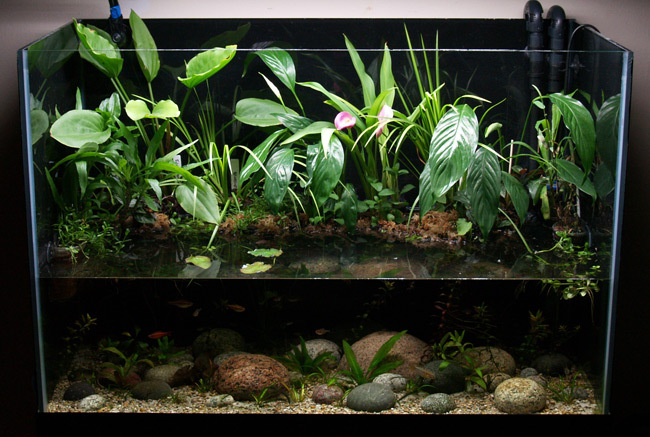 Great use of the Golden Rule and a V shaped aquascape. For more information on the aquarium, including plant species, lighting and fertilizer specs, and hardscape pictures, check out the thread here. I'm sure we've all had our share of mishaps when it comes to keeping aquariums. Mixing glass, water, and electricity is a recipe for disaster. I thought this thread about aquarium mishaps was pretty interesting, and I'll share my biggest mishaps to date. First of all, I've come to the realization that heaters, submersible or not, are probably the most dangerous piece of equipment in an aquarium. They're often glass, and sometimes non-submersible. Combined with electricity...well, it's a bad mixture. Most of the time it's as simple as forgetting to turn the heater off when you do a water change. The heater turns on, heats up much to fast (since it's supposed to be "cooled" by water) and either burns up or, even worse, when you refill the tank, cracks the glass when it comes into contact with water again. Some heaters are designed with an auto-off switch to prevent this. I've killed at least two heaters this way. Luckily, it's fairly easy to notice, given the smoke, steam, and possible fireworks. One of mine just burned up before I raised the water back up, but the other shattered when it contacted the water. Luckily, my fish (and me!) got away without any injuries. I've vowed to never buy cheap heaters again, and always, always use a GFCI outlet or power strip (which should probably added to the 10 Items a Planted Aquarium Keeper Can't Live Without list). Another mishap occurred when setting up my pressurized CO2 system. I bought a regulator with a bubble counter and filled it with water. I screwed the cap on tight and everything was great for about 2 weeks. Then I noticed that my water level was dropping more than normal between water changes, and the bubble counter was often full of water. It had an integrated check valve, so I wasn't worried about my regulator being damaged. However, I then realized that the floor of the stand underneath the tank was literally mushy and soaked. I examined the CO2 setup for leaks and realized that on the back side of the bubble counter, hidden out of view, was a nice big crack that must have been slowly spreading since I screwed the cap on. Each night, when the CO2 went off, water would siphon back and drip out through the crack. My stand is pretty funky inside now, and the particle board that got wet is deformed and expanded. Let's just say the floor inside isn't exactly flat anymore. I ordered another bubble counter and was extra careful screwing it in. I've accidentally overfilled my tank while doing a water change and watching TV at the same time. I suddenly had a waterfall in my living room! Don't multitask while filling your aquarium back up. I've accidentally run my Eheim filter overnight with a kinked hose. Woke up wondering what the funny burning rubber/plastic smell was, till I realized it was my fish tank. The Eheim took it like a champ though, and still works fine. I count myself lucky that I've avoided most major mishaps (no cracked tanks, major water damage, etc). What about you? What planted aquarium mishaps have you had? My apologies for being a bit late on this, but moving is one of the most stressful life events, and all the planning in the world can't prepare you for everything. It took the internet company 2 weeks to sort out the internet to finally work at the new place, so my blogging has been limited. Just as a recap, this is the story of moving my two aquariums, a 10 gallon and a 46 gallon bowfront, both fully planted. The goal was to move them without messing up the aquascape too much and without completely emptying the aquariums, while keeping all fish alive. 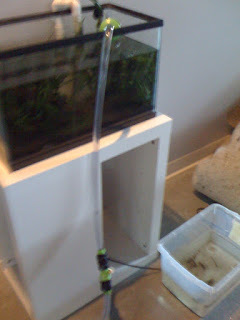 On moving day, I brought out the plastic tubs and a siphon tube and siphoned out about 5 or 6 gallons of the tank water into it (less for the 10 gallon). Then I caught each fish one by one and put them into the water in the plastic container. This was easily the hardest part of the whole day. I nearly ripped up each and every plant to try to catch the fish. The hardest by far were not the Otocinclus catfish as I had expected, but the Rummynose Tetras. They had a distinct ability to swim under the carpet of Blyxa japonica and would not come out without poking and proding. Once I had all fish in the plastic tub, I put some plants in with them to provide cover and oxygen. I also put the container's lid on to keep it dark and prevent as much stress as I could. You have to be careful though, since a sealed container will eventually run out of oxygen and the fish will suffocate. Only leave the lid tightly on when absolutely necessary. 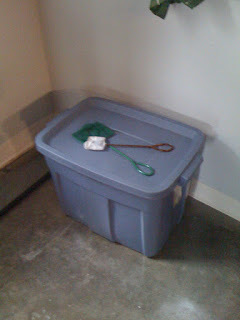 With all the fish safely ready for transport, I turned my attention to draining the remaining water. I made sure to turn of and disconnect my canister filter, CO2, and lighting and packed them up separately. Using my Python, I drained the water down as far as I could (about 1/2" of water left above the substrate). I packed the stands, tanks, and plastic containers into the rented van and trunk of my car with the help of a friend and made sure they were well secured and padded. The last thing I needed was for the plastic container to become a permanent home. I used glass covers to keep the moist air inside and a spray mister to make sure the plants didn't dry out. I carefully made the drive over to the new place with all pieces and fish arriving safe and sound. Now it was time to set everything back up. I had planned out where I wanted each aquarium to go in the new place, so this wasn't hard. 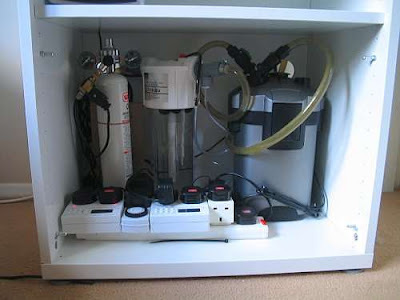 I set it up and began to fill it with tap water, along with dechlorinator. While it was filling, I took a bowl and began scooping some of the water from the plastic tub into the tank. That way the water parameters would be a little bit closer to the old tank. I was only moving across town, so the water was the same as the tap water in my old place, but if it's very different, you'll want to use as much of the old water as you can to mitigate the difference. Once the tank is fairly full, you can start catching the fish in the tub and putting them back into the tank. Watch them carefully for signs of distress. The temperature should be roughly the same. Too great a difference could kill them. Reconnect all your equipment, top off the tank, and you're back in business! You're going to be sweaty, stinky, and gross after you move a tank. Don't plan on any social events after! Catching fish with lots of plants and driftwood is a nightmare. Try to remove whatever you can without affecting the aquascape too much. If you run into problems catching fast little fish, keep at it. Eventually they will get tired and slow down. Just try not to harass them any more than necessary, since it will stress them out. Having a friend to help with another net is priceless! 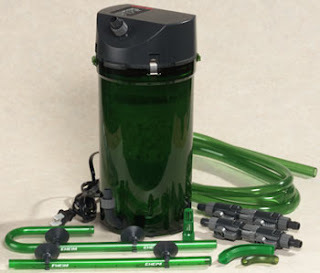 Keep your filter full of water so the bacteria inside can survive the trip. Set up the tank as soon as you can at the new place. The less time the fish spend in the temporary plastic container the better. Certainly don't keep them in there for longer than 6 hours, or you may need to add a temporary bubble filter or change out some of the water to prevent fouling. Overall, the whole process was fairly easy. No fish or plants were lost and everything is getting back to normal. The key here is patience and planning. I didn't move both tanks on the same day along with all my other furniture. That would have been just plain crazy. I would recommend planning plenty of time to move an aquarium, and then double it. It always takes longer than you expected, especially if you have expert hiders like the tetras! Good luck! I just wanted to post a quick note that I have finished moving successfully (no fish, plants, or equipment were lost!) and I will post an article on the move, but it's going to be a bit delayed since I'm dealing with some internet issues at the new place so my connection is a bit sporadic. Hopefully I'll get it fixed soon and have a full write up of the next part of the aquarium moving series done soon as well. 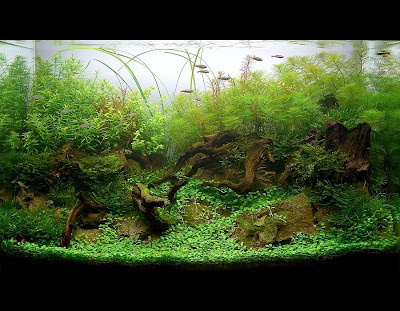 The deadline for submitting an application to the 2009 IAPLC has come and gone, but don't worry, you still have a chance to make it into the second prestigious annual aquascaping contest, the AGA International Aquascaping Contest. 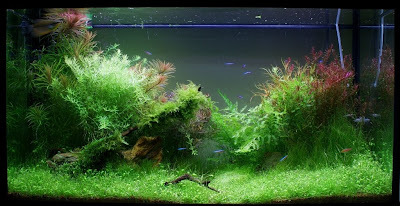 You have until September 15th, 2009 to get your aquascapes in order and submit an application for a chance to win a number of cash prizes. You'll find the entry form and the 2008 entries (the picture above is the 1st place winner in the "Large" category for 2008) on the AGA website. Below is the release from AGA. Good luck! It's that time of the year again! The AGA's annual aquascaping contest opened on June 15th for submission of entries and was recently announced on the AGA's website. As in the past, all information including guidelines, entry forms, and other pertinent information regarding the contest is provided on the website, www.aquatic-gardeners.org. For the contest to be a success, we are again looking for some volunteers to help with the work load. The quality of the contest each year depends on the level of participation from dedicated volunteers around the world. This year is no exception. Of particular importance is finding some people to volunteer for posting of information on websites both in the United States as well as internationally. If you are involved with an internation forum or club, please consider helping out by posting announcements to the forums you frequent. We're also looking for someone with some graphics design experience to create some cool graphics for the contest. I look forward to seeing the aquascapes again this year! I love DIY projects. There's just something way more satisfying when you complete something yourself. I was pretty excited when I found these DIY project ideas on Instructables, an external CO2 diffuser and an inline heater using a water filter housing. The idea is simple and aside from having to purchase a heater with an external thermostat (so you don't have to open up the CO2 diffuser every time you want to adjust the heater temperature) looks to be pretty cheap and effective. 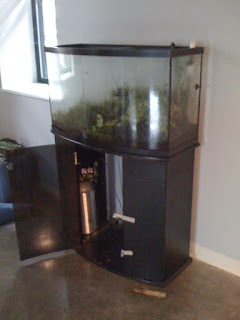 I'm all for removing equipment from aquariums since no one likes have a nasty looking heater spoil their aquascape, and placing it inline after your filter can even make it more effective. Once I'm recovered from my big move, I might have to give this a try. Great job thewhite! 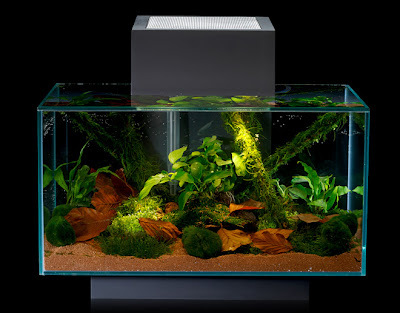 Moving an aquarium is a daunting task, but moving a fully planted aquarium is monumental. Although it may be a lot of work, it is entirely possible without ripping everything up and giving away your fish. How do I know? I've done it before, and I'm about to do it again. Yes...I'm a little bit crazy. Last time I moved was in June 2006. Back then I had three aquariums, a 20 gallon long, a 10 gallon, and the largest, a 29 gallon tank. I only moved a few miles away, so it wasn't all that bad. 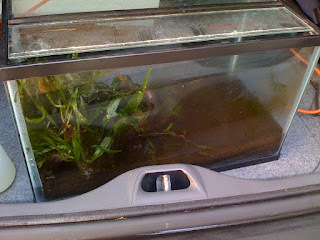 The tanks were small enough to fit in the back seat of a car (even the 29 gallon) which made it much easier. The move went very well, and I don't think I lost a single fish. I'm moving again on July 1st, and once again I've got to figure out how to move my planted aquariums. Since then I've upgraded to a 46 gallon bowfront (seen above, please excuse the iPhone photo, my camera is already packed!) and kept the 10 gallon. Both are heavily planted and happily inhabited by fish. The most important part of this whole process is the planning. Thinking through exactly how you are going to complete the move and issues that might come up will save you time, and possibly some lives. How will I transport the fish and keep them alive? I tried this technique back in 2006 and it worked so well I'm doing it again. I have two large plastic tubs I bought at Target for about $10 each. I'll fill these up with tank water and some plant clippings to provide cover and rudimentary filtration/food for the short trip. Then I'll catch all the fish and put them into the tubs. Sounds easy right? Wrong. This is probably the hardest part of all. How will I transport the tanks? Well there's no way I can transport a fully filled 46 gallon tank that approaches 500lbs. That would be a disaster even for the smaller 10 gallon. So instead, I'm going to drain out as much water as I can from both tanks, putting enough into the fish tubs to keep them happy (but also not too much that I can't lift them). Here is where the Python comes in handy. I'm able to drain all but about 3/4 an inch above the substrate level, which has 2 benefits. First, it keeps the substrate wet which keeps colonies of beneficial bacteria alive, and second it makes the tank much lighter. To keep the plants from drying out, I'm planning on taping a garbage bag over the top (plastic wrap for the smaller tank) and using a spray-mister. The 46 gallon and stand definitely don't fit in my back seat, so they'll have to be moved the same day I move all my larger furniture, for which I've rented a cargo van. What about the filters? Pressurized CO2? Right now I have two Eheim canister filters, one for each aquarium. I'll simply use the shut off valves provided and disconnect them, keeping them full of water for the move. This ensures the beneficial bacteria inside won't completely die out (as long as the move doesn't take too long). For the pressurized CO2, I'm going to shut it off and disconnect the regulator before moving it. The most important thing is to properly secure the CO2 tank. I've heard plenty of horror stories of improperly secured CO2 tanks falling over and opening in a car. It's summer, so keeping everything out of the direct sun and cool is important. I wouldn't do this in winter, the changes in temperature may be too severe for fish and plants. Lift the tanks slowly and evenly. Twisting or torquing the tanks excessively can lead to cracks. Use plenty of padding when putting the tanks in a vehicle and drive carefully. Make sure to tie them up so they don't move around. Figure out where you are putting your aquariums in your new place ahead of time. You don't want to have to repeat this process later! Consider the floor (can it support a large tank?) and also the proximity to a water source. You can buy a 100ft long Python, but it's much easier to use a 25ft or 50ft. Power outlets are also an important consideration. Luckily, I have no stairs or tight corners to deal with, but if you do, make sure your tank will fit without having to upend it, or this method won't really work for you (horrible images of being showered with muddy substrate while trying to hold up a tank come to mind). Will everything go according to plan? Not likely, but it still helps to minimize the risk of something unexpected popping up mid-move. The next part of this series will be documenting the move day prep and process (with pictures). Look for it once I get settled in at the new place! One of the biggest parts of growing aquatic plants is being able to "read" them and evaluate how healthy they are. 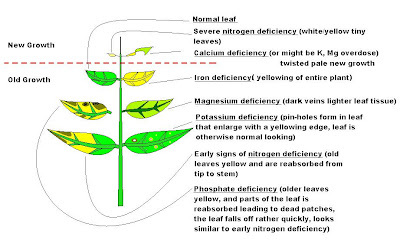 Learning all of the signs of nutrient deficiencies can be confusing though, so a picture is worth a thousand words. Zapins over at APC has done exactly that and created a handy diagram showing what common aquatic plant deficiencies look like. I have to say this is a really excellent diagram that I will undoubtedly be using in the future. Nice job Zapins! I've finally thrown in the towel on the last of my emersed grow out containers, since the bulb burnt out and I didn't realize it, and all my dwarf hairgrass in it died. I have to admit, when it works, growing plants emersed is much faster and less intensive than a grow out tank. Not having to dose fertilizers, worry about CO2, or plants that wont stay planted is fantastic. It does have its drawbacks though, since my HC was overrun with some sort of slime mold, and before that it was infested with little bugs. The transition from submersed to emersed and back again can be tricky as well. What about you? Have you ever tried to grow any plants emersed? Do you think it's worth it? First off, I love the plant on the top right. Not sure what it is, but the fluffy, feathery leaves are very interesting and remind me of a stand of pine trees. Nico has also done an excellent job using hardscape here, with the gnarled driftwood looking simply amazing (be sure to check out the additional photos in the thread for some sweet "ground level" shots). With all that's going on in the foreground, center, and back right, the back left feels almost neglected! Gotta love that hill too. I wonder if that's built up substrate or just an illusion using the Glossostigma over rocks and hardscape? And all this in just a 17 gallon tank! It easily looks double that size. Excellent job Nico! 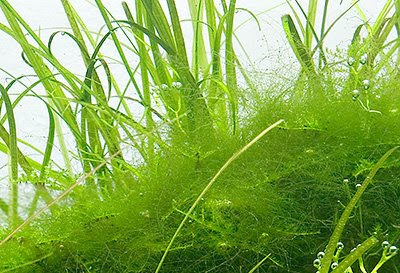 You may have heard some of the buzz surrounding ripariums, or "riverbank" tanks, which has been growing on aquascaping forums and websites lately. It wasn't till I saw Hydrophyte's Riparium Supply website that I started getting really excited. 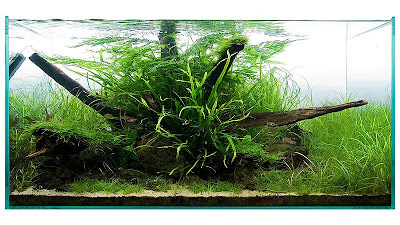 Not only are the ripariums on the site beautiful (see above and below) but they provide a really attractive alternative for growing out aquatic plants and are a fresh new approach to aquascaping (err..maybe ripascaping?). 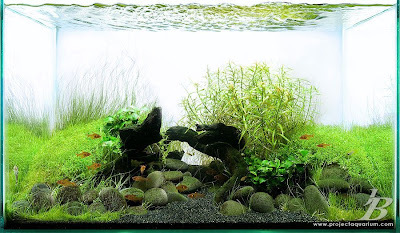 The whole concept of a riparium is that you are simulating the bank of a riverbed or pond, without actually creating any physical dry ground (that would be a paludarium). So you get to grow your aquatic plants emersed in hanging planters, which means they grow much faster. Not only that, but aquatic plants often have very different forms when grown emersed, which means you often get completely different leaf shapes, growth patterns, and even flowers! The best part: you can still keep fish and use your normal aquarium equipment. You can even still grow plants submerged. CO2 isn't needed either, since there's plenty of it in the atmosphere. You can also keep new animals, like freshwater crabs, amphibians, and reptiles. You'll need some additional hardware to pot and hang the plants, but that's it. If I had an extra tank and wasn't moving in a few months, I'd definitely try this out. 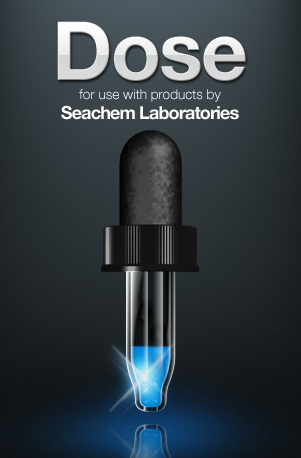 If you'd like to give it a whirl, check out Hydrphyte's blog for more information and updates. You can also buy some riparium hardware from the Riparium Supply store. 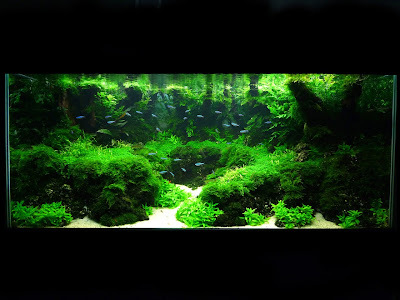 Aquascape of the Week: Radek Baszak's "Up the Scarp"
A few days late due to vacation, but better late than never! This little aquascape is so visually interesting. Radek Baszak has done a wonderful job selecting and arranging plants with contrasting textures to create lots of interest, as well as that awesome rock formation. I don't know if it was many hours of teaching the fish to "stay!" or just waiting for them to be in the right place at the right time, but they are perfectly posed as well. For more information on this tank, Mr. Baszak, and the rest of his tanks, take a look around his website. Well, this is the long overdue Aquascaping Answers that I've been too busy to write for a while now. Sorry if you left a question and were disappointed, I've copied them down and will try to get to them all eventually! Unfortunately I have decided that I shouldn't spend a whole lot of money right now, and I don't think I will be able to handle dosing fertilizers every day or every other day (I'll forget...). But, there's hope! An El Naturale tank. I know that they typically use no filters, but I have already purchased my Eheim Classic 2215. My sense tells me that I could still set up an El Naturale tank, but I may have to dose Nitrogen (which is easier and cheaper than everything else in addition! 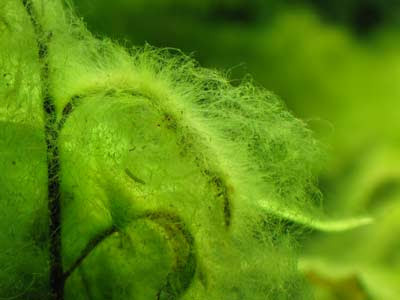 ), to replace the ammonia which the bacteria would be eliminating. My setup would be a 46 gallon bow-front with a DIY 96 watt PC fixture (about 2 watts/gallon) with the Eheim 2215 and a soil substrate... Is this feasible? Would I have to dose Nitrogen? How heavy should my fish-load be? Thanks for helping me get started in the planted tank niche with a beautiful tank!! 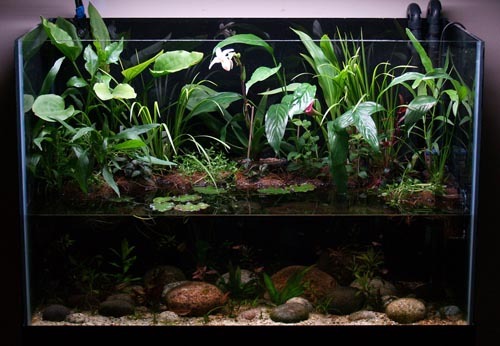 I would become fully familiar with the differences between an El Natural tank and a higher-tech Dutch or Nature Aquarium aquascape. They're very different styles, in almost every way. If you'd like to grow fast growing, high light plants, I wouldn't settle for an El Natural. On the other hand, if you are perfectly content having a "set it and forget it" tank that you can pay attention to whenever you have a spare minute every couple weeks or so, and that won't necessarily rival Amano's tanks, El Natural may be right for you. Pick which ever one you think you would enjoy more. If you are only worried about dosing and remembering to dose fertilizers, build a simple and cheap DIY fertilizer auto-doser. It doesn't cost more than $30-$50 and you'll never have to worry about forgetting a dose again, except that is till it runs out of mix (no wonder my algae was coming back with a vengance!). For details on an El Natural and whether or not you should dose nitrogen (I highly doubt you'd need to) I'd suggest buying Diana Walstad's book or checking out the El Natural forums on Aquatic Plant Central. The rest of the tank specs sound fine, and I'd stock it only slightly heavier than a normal tank. 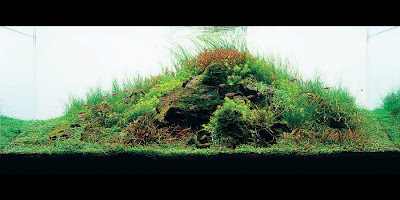 This week's aquascape is a really fantastic layout from the 2008 IAPLC (ADA) contest, where it ranked 176th. The "canopy" of plants is just amazing and must have been quite hard to accomplish, but it is certainly stunning. Combined with a unique orange sunset-like background, the green of the Hemianthus micranthemoides in the canopy really stands out and is just fantastic.